Slope Down : it’s a huge descent with a high speed through the green plains and cliffs. Arcade where you have to find out a Crystal and save the World from a coming disaster. Pick up your sphere and let’s start the trip! From little slopes to dangerous canyons – it’s time to start your beautiful journey. 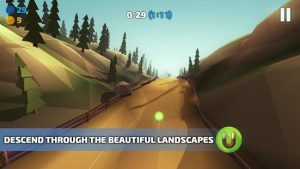 So, are you like runners, high speed, arcades and low poly graphics? Well, consider this your green light to start a journey! I didn’t expect much, but the game is surprisingly fun and addictive. Interesting gameplay & nice graphics. I like it! Please try to review it with the new version: 1.09 The crashes should be fixed! Please let me know once you check it.